Don’t leave yourself open to vulnerabilities because you missed an update. Things change on a daily basis – patching, configuring, and constantly monitoring an on-premise firewall is a job in itself. Lanworks Managed Firewall Services keep your network protected and up to date with priority firewall administration, log monitoring, and speedy responses to security and device health events. Trust Lanworks certified security experts to swing into action before you even need to know about it. A properly set up and managed firewall can provide strong security and optimize your internet performance. Improperly set up firewall only provides a false sense of security. Using a security expert to define firewall policies and set appropriate firewall rules is a must. Our managed security solutions are there to help you establish policies, configure, provide firewall monitoring, and maintain your firewall so that it remains secure even as your company changes. 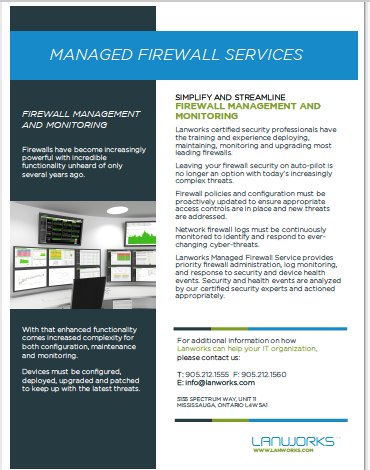 Click image to open our Managed Firewall Services brochure! Avoid the increasing hardware and software expenditures as your business grows. Small to mid-sized businesses benefit from our affordable, efficient, concierge-style Managed Firewall Services for 24/7 value. Your IT team is likely stretched as it is.